Poultry – Sellick Equipment Ltd.
A wide selection of two- and three-stage, all roller, SEE-THRU© masts is offered. The SEE-THRU© mast provides outstanding visibility, and the internal hydraulic supply eliminates high maintenance and costly hose reels. Poultry Coop Handlers have full lift capacity to maximum fork height to insure operator safety and efficiency. All models are available in two- or four-wheel drive equipped with disconnect for excellent on-command traction. Models are fitted with a heavy duty steer axle featuring sealed, tapered roller bearings and remote grease fittings to centre pivot, which provides ease of maintenance and capacity to handle the toughest jobs. Models are also equipped with up to 40° carriage rotation to facilitate broiler and pullet handling. The S Series forklift is equipped with spring-retract braking which generates less brake heat and less wear thereby lengthening component life. The power braking system requires less operator effort. 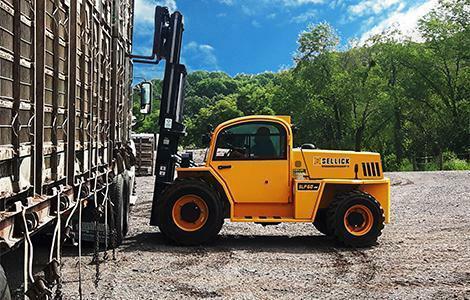 Sellick forklifts are backed by the best warranty in the business. In addition, a national distribution network for parts and service offers prompt and personal service when you need it.